smashingmagazine.com has a good article on 80 Beautiful Typefaces For Professional Design (feed). I've always wanted to know which of the fonts installed on my system are considered good by designers. 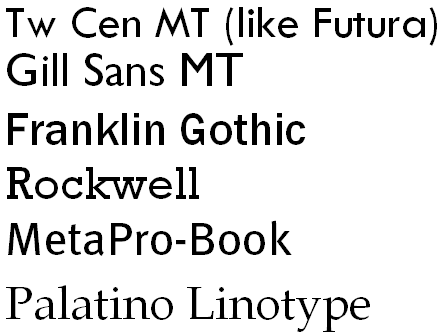 After painstakingly comparing their list of fonts with what's on my system, I have found that six of my fonts pass muster - yay! posted by Jonathan at 8/16/2007 02:38:00 p.m.
By Jeff, at 8/20/2007 8:27 a.m.
Have you read this post on codinghorror.com about fonts? By Jeff, at 8/20/2007 8:29 a.m.
Jeff - I enjoyed that - thx! By Jonathan, at 8/20/2007 10:45 p.m.